This charming cottage houe plan showcases Craftsman exterior features and a well-appointed interior. The master suite is positioned for privacy with no other bedrooms around it. Rear-porch access and a cathedral ceiling highlight the master bedroom. A large walk-in closet and elegant bathroom complete the suite. 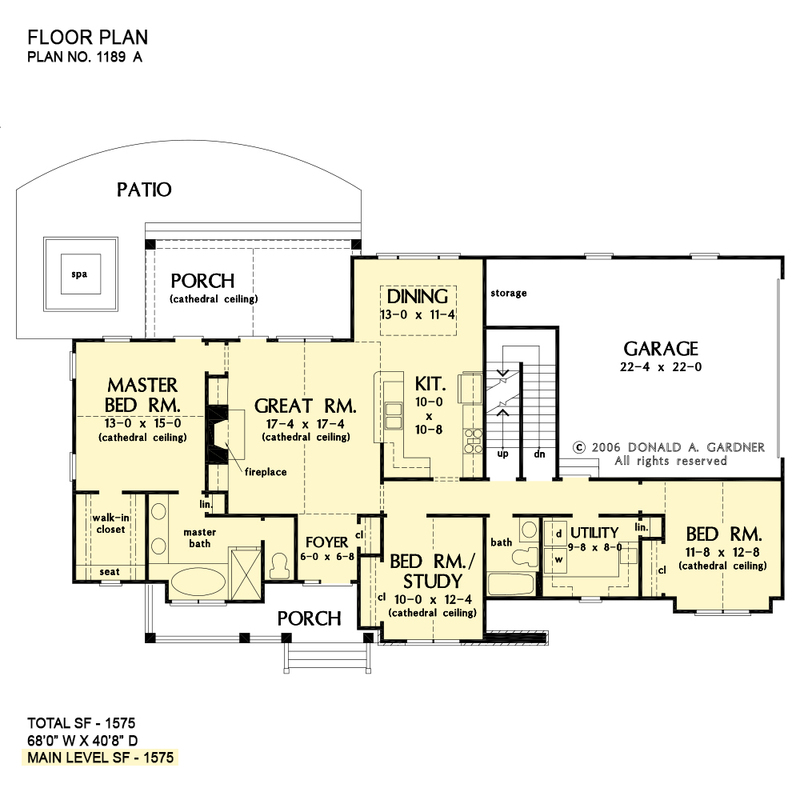 The other bedrooms are located on the opposite side of the house plan and are separated by a utility room and bathroom, granting everyone privacy. 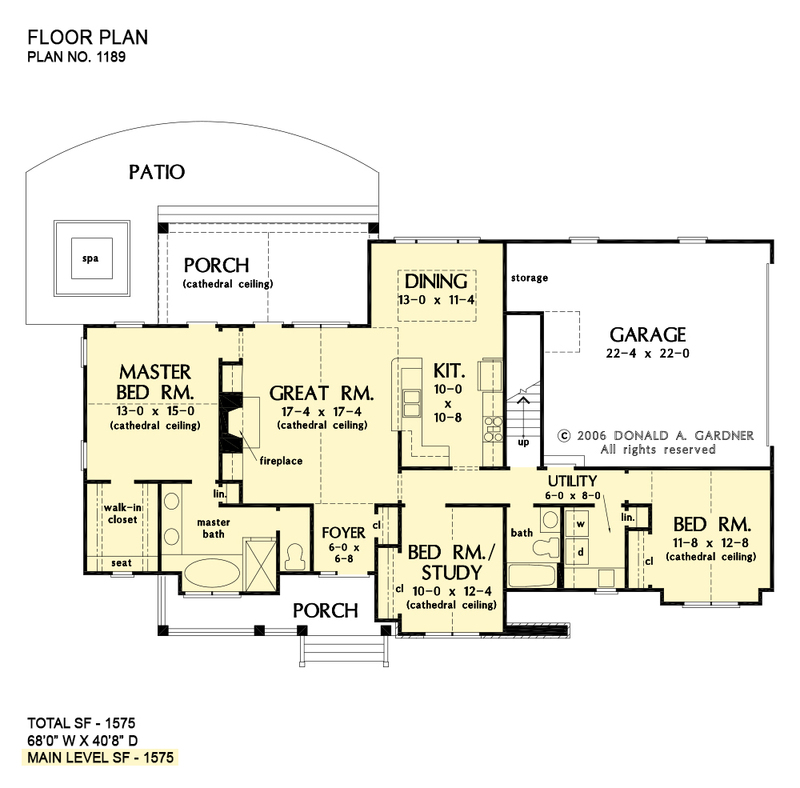 The great room and kitchen are the hub of the house plan and provide an easy flow from one room to another. With a fireplace, cathedral ceiling and porch access, the great room is sure to be a favorite entertaining space. 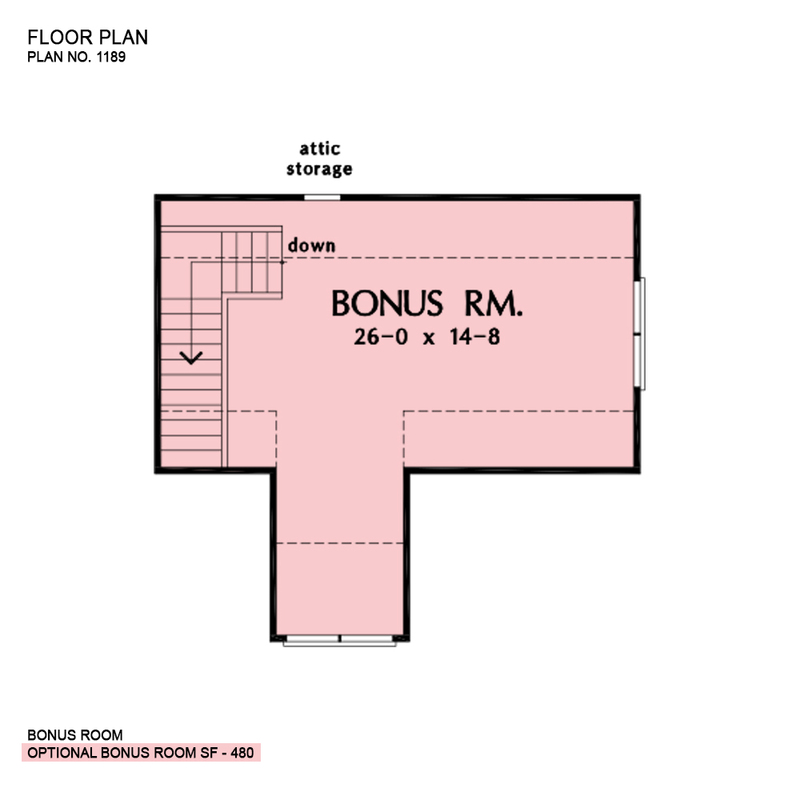 Upstairs, a large bonus room serves is the ideal recreation spot, as families can use it while their family grows. 1st Floor: 1575 Sq. Ft.
House Dimensions: 68' 0" x 40' 8"
Great Room: 17' 4" x 17' 4"
Bedroom #3 (Cathedral): 11' 8" x 12' 8" x 12' 6"
Bedroom / Study (Cathedral): 10' 0" x 12' 4" x 12' 0"
Bonus Room (Vaulted): 26' 0" x 14' 8" x 8' 0"
Deck / Patio : 13' 0" x 19' 8" x 9' 0"
Dining Room (Tray): 13' 0" x 11' 4" x 10' 0"
Garage : 22' 4" x 22' 0" x 0' 0"
Garage Storage : 3' 8" x 6' 10" x 0' 0"
Great Room (Cathedral): 17' 4" x 17' 4" x 14' 6"
Kitchen : 10' 0" x 10' 8" x 9' 0"
Master Bedroom (Cathedral): 13' 0" x 15' 0" x 13' 6"
Porch - Rear (Cathedral): 21' 0" x 10' 0" x 9' 0"
Porch - Front : 9' 4" x 6' 0" x 9' 0"